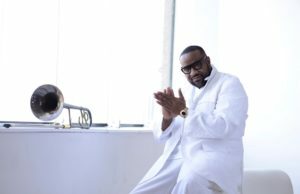 A North Philadelphia-born soul-jazz and hip-hop/funk innovator and trombone virtuoso, Jeff Bradshaw spent his formative years honing his chops alongside some of the biggest names both in and out of the Philly soul movement. By the time he got around to releasing his solo debut, 2004’s critically acclaimed Bone Deep, he had shared the stage with industry luminaries as Michael Jackson, Earth, Wine & Fire, Patti Labelle, Erykah Badu, and countless others. Bone Deep made him a festival circuit mainstay, and he spent the next eight years refining his signature smooth and immediate sound in both a solo setting and in support of artists like Mary J. Blige, Jay-Z, the Roots, and Jill Scott. In 2012, he issued his sophomore long-player Bone Appetit, which featured a hosted of guest artists, including Kindred the Family Soul, Raheem DeVaughn, Floacist, and Marsha Ambrosius.